One of the most memorable episodes in the British UFO experience centred on Warminster in Wiltshire. A town with a strong military presence thanks to the nearby Salisbury Plain army training grounds, in the mid 1960s it found itself at the centre of strange events. The first sign that something unusual was afoot came in 1963 when, on several separate occasions, some householders reported hearing a horrendous noise in the sky at night. Often, they recalled fearing that The Thing, as it came to be called, was having some physical impact on their homes, shredding the roof tiles for example. Whenever they went outside to take a look afterwards, however, they would tend to find no sign of anything amiss. Sometimes, they would even ask their neighbours whether they had heard anything, only to be told that they had not. At this stage, no one had ever seen The Thing. It was an entirely auditory phenomenon. Word of the incidents soon spread till the existence of The Thing became common knowledge in Wiltshire. Journalist Arthur Shuttlewood wrote about The Thing in the local newspaper, The Warminster Journal. Increasingly, he became a focal point for the strange goings-on in the town. 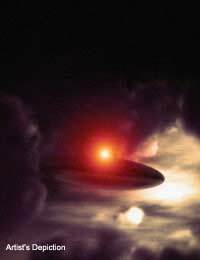 People who had experienced anything out of the ordinary would contact him to tell about it; and any outsiders who wanted to hear the latest buzz would make their way to him.Initially, no connection was made between The Thing and UFOs. It was regarded as nothing more than a weird phenomenon which had not yet been explained. After the first sightings of The Thing in late 1964, however, the UFO interpretation became dominant. Most eye witnesses described seeing a seething ball of light in the sky, often surrounded by some kind of smoke or cloud, and emitting something like sparks of crackling light. One, a man named Gordon Faulkner, even claimed to have photographed it. This amazing image, showing what appears to be a circular craft or a saucer-shaped craft flying on its side, was published in the national press and helped draw attention to what was going on in the town. Debate continues about whether or not this famous photograph is authentic. In the 1990s, one man claimed to have helped Faulkner fake it. Faulkner denied this, however, and said he did not know the man. Word of the strange events in Warminster spread nationwide and soon it became a place of pilgrimage for seekers after truth. There were nightly vigils on Cradle Hill, where strangers would stand, scouring the skies for saucers, listening to the voice of Arthur Shuttlewood as he guided the visitors’ interpretations of what they saw. Many of these people claimed to have seen UFOs for themselves during these sky-watching sessions. Events in Warminster seemed to mesh perfectly with the dominant flower power ethic of the time. Here were the Space Brothers, perhaps preparing to make open contact for the first time and usher in a New Age for humanity. Warminster continued to be a focal point for UFO reports until the mid 1970s. Although some still claim to see UFOs there today, sightings are nothing like as common as they were before. Other than alien vehicles, the most obvious explanations for the strange events in Warminster relate to the military. Salisbury Plain is the largest military training ground in the UK. It is used almost daily for live fire exercises including artillery barrages and aircraft bombing runs. Perhaps these accounted for some of the strange sounds or curious lights in the sky. Yet the area had been used for military training since the 19th century. The local population must have grown used to this. Why, then, should they become so alarmed by the sights and sounds only in the mid 1960s? Those seeking paranormal explanations point to the prevalence of ancient monuments and mystical sites in the area surrounding Warminster. Even the army training area contains several ancient barrows (or burial grounds). Could modern UFO activity in some way relate to these ancient sites? Some believe that UFOs or their occupants were worshipped as gods by primitive peoples. Perhaps Warminster has been a centre of strange activities for centuries. Unlike many UFO encounters which today are more celebrated, the Warminster flap was sustained for almost ten years and involved thousands of witnesses in total. It deserves to be remembered as one of the most fascinating chapters in the history of British ufology.